President Hage Geingob (file photo). Windhoek — Namibian President Hage Geingob yesterday issued an ultimatum to France Radio Internationale (RFI) to retract a widely circulated online article suggesting that he received questionable payment from the sale of Canadian firm UraMin's Namibian assets to Areva, a French nuclear power company. Failure to do so could prompt the president to take unspecified action against the French broadcaster, his lawyers stated in a letter of complaint yesterday. Africa Mining Intelligence magazine first reported in 2012 that Geingob "pocketed $300 000 (N$3.6 million at current rate) for facilitating the sale of UraMin to Areva." Geingob, speaking to New Era at the time, said he only worked as a consultant to UraMin in 2006 and 2007, when he helped the Canadian company to obtain a mining licence in Namibia. "I was not involved in the sale of UraMin's Trekkopje to Areva, at all. I only read about this transaction in the newspapers," said Geingob at the time. But over the weekend, RFI reported that former head of Areva's mining branch Sébastien de Montessus has been charged with corruption in relation to Areva's purchase of UraNim's Namibia mine, Trekkopje, in 2007. "Payments to a Namibian mining company and its current president [Geingob] are under the spotlight," RFI reported. "The inquiry is looking into 5.6 billion euros paid to Namibia's United Africa Group in 2009-10 and 8,000 euros paid in 2008-09 to current President Hage Geingob, who was trade and industry minister at the time," the international radio network further reported. Geingob had previously maintained that his consultancy work for UraNim, carried out through his now defunct HG Consultancy outfit, was conducted while he was a Swapo backbencher in the National Assembly. Former president Hifikepunye Pohamba appointed Geingob - who left Cabinet in 2002 - as his trade minister in April 2008. "The consultancy through my company known as HG Consultancy, took place while I was a parliamentary backbencher and not a minister and I repeat, not a minister," Geingob said in response to New Era six years ago. But the RFI report last weekend painted a contrasting picture, linking him to the sale of the Canadian company's assets, a process Geingob denies he was involved in. The purchase of Trekkopje has already seen former Areva boss Anne Lauvergeon and two members of her team being charged with the alleged overvaluation of the sale to conceal the fall in the price of uranium at the time. Lauvergeon's husband, Olivier Fric, has allegedly been charged with insider trading on UraMin shares, while investigators are allegedly looking into his links with Belgian financier Daniel Wouters, who was detained last week. De Montessus was reportedly charged late last month in connection with suspected misappropriation of funds, an accusation that he denies. 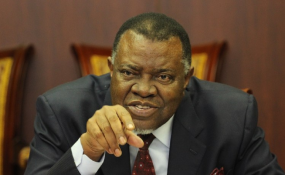 A clearly unimpressed, Geingob yesterday demanded through his lawyers a full retraction of the article linking him to the transaction between Areva and UraNim, maintaining he was nowhere near that process. His lawyer Sisa Namandje, in a letter to RFI, said the article contained "untruths and imputations of dishonesty towards Dr Geingob" and demanded its immediate retraction. The President said he reserved his rights if no retraction was effected, hinting at a possible lawsuit against the French broadcasting giant. Geingob said by dragging his name into the UraNim/Areva transaction, RFI was being sensational and hell-bent on finding an African connection to a case of alleged corruption by Canadian and French owned-businesses. Namandje said to this day, Geingob has not been approached by any investigation authority over the allegations, despite the probe having been going on for five years.